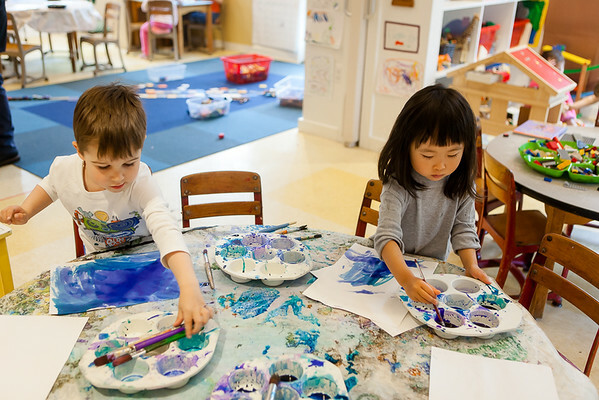 Cambridge Nursery School was founded in 1923 by noted educator Abigail Eliot who believed in "children's imagination, and in giving children a chance to do the things which they naturally do and to grow at their own pace." Abigail Eliot was guided by the belief that young children learn much of what they need to know through play. After more than 90 years, we continue to provide a rich and varied play-based program in a warm and nurturing atmosphere. Teachers support each child’s emotional, social, cognitive, and physical development through a wealth of developmentally appropriate activities that emphasize building relationships with other children and adults and increasing confidence and independence. At the beginning of the school year, our focus is on easing the transition from home to school. As children become increasingly comfortable with others and familiar with the routines of each day, they will confidently explore, observe relationships and patterns, and build their skills. We help children express their needs and feelings and teach them to listen to and respect the needs and feelings of others. meet our teachers ~ about our program ~ what is a cooperative school? Cambridge Nursery School was founded in 1923 by a group of five Cambridge mothers, which included Dr. Abigail Eliot and Mrs. Erwin H. Schnell. Dr. Eliot, a Radcliffe College graduate and pioneer in the field of nursery school teacher training, was interested in offering children programs based on the then-new English nursery school model. The Cambridge School met on a trial basis for three months in the spring of 1923 in the home of Mrs. Esther S. Schell at 4 Shady Hill Square. The experiment was a success, and the school moved in the fall of 1923 to a small building on a Farrar Street lot "about as big as a clothes yard" lent by Mr. Hicks. In 1924 the group "with gifts and loans from interested friends" bought the lot next door and moved the small building there, building on two more rooms to form a three-room bungalow believed to be the first building erected as a nursery school in the United States. In 1925 the group incorporated as the Cambridge Nursery School. From the very beginning the school was a parent cooperative (or mother cooperative) with mothers helping in the classroom and serving on the executive committee. In the 1920's, mothers not only helped in the school once a week, but also met with the director once a month to discuss problems of child care and wrote papers and reviewed books on child care. In the early years of the school some of the mothers attended lectures on preschool education by Professor L.J. Johnson of the Harvard School of Education. In 1926 a second group of children was formed to accommodate increasing enrollment and to expand to another neighborhood. From 1926 to 1928 the group met in the home of Hallowell and Pauline Davis at 82 Avon Hill Street. In June of 1928 Cambridge Nursery School bought land at 6 Hillside Place from Mr. and Mrs. Davis. It borrowed $4000 from the Institution for Saving in Roxbury, giving it a three-year mortgage on the property and entering a construction loan agreement with it. Gifts and loans ranging from $5 to $200 from parents and "such interested persons as appreciate the merits of the School," made the new property possible. The Cambridge Nursery School building was constructed in the summer of 1928, and the Avon Hill branch of the school opened there in September of that year. In the early thirties the Farrar Street branch was used for two-, and three-year olds, and the Hillside Place branch for four-year olds, but by the early forties this division had been discontinued and each branch of the school took all ages of preschool children. In the thirties the school sponsored a second-hand store for children's clothes, toys, and furniture, partly to benefit the school and partly to help along its "research in scientifically correct toys." The school received royalties on such designs as a doll carriage which would support the weight of a child and a combined table and chair that could be used as a playpen. By 1936 an annual May picnic had been established to benefit the school, on the grounds of Professor Paul J. Sache's Shady Hill estate on Irving Street. This picnic, with a maypole, balloons, dances, games, puppet shows, and pony rides, was open to all children from two to eight years old and by 1950's had become a Cambridge institution. In 1967 the Farrar Street building was renovated, but in 1977 the two branches were consolidated in the Hillside Place building. Since then, Hillside Place has been the sole site of the Cambridge Nursery School. The school remains a parent cooperative preschool today. In the fall of 2013, our historic school building underwent a major renovation. Since February of 2014, we have been enjoying our wonderfully renovated building, complete with its bright and airy, open-plan classrooms, new library, and water and sand tables. The school is exactly what everyone hopes their child will get to experience-small, intimate, warm, safe, nurturing, and full of wonder. I love that the new building feels like a house but is perfectly designed for small children. Tucked away on a hill at the end of a quiet dead end street, with a large outdoor play area, it's a perfect sanctuary for kids in the middle of the city."